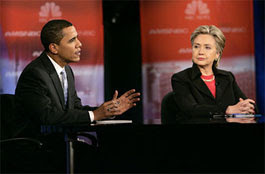 In a fundraising email sent out this week, Illinois Senator Barack Obama has accused his opponent, Senator Hillary Clinton, of “Swift Boat Style Tactics” in an obvious misuse of the term that became popular after the 2004 defeat of Democrat John Kerry. The campaign email makes note of ABC’s report on the group American Leadership Project, set up to promote Hillary Clinton, but prohibited from coordinating with her campaign. “The so-called "American Leadership Project" will take unlimited contributions from individuals and is organized the same way as the infamous Swift Boat Veterans for Truth. Groups like this are forbidden from working primarily for the purpose of electing or defeating a candidate. This raises a number of legal and ethical issues, but more than anything it reveals an attitude towards politics as a game that is played to win at all costs. The Swift Boat Veterans for Truth were a group of over 250 Highly Decorated Viet Nam Combat Veterans exercising their constitutional right to organize against a candidate they felt Unfit for Command due to their time served either with the candidate or his anti-war actions committed after an abbreviated tour and were comprised of members of all political persuasions. Contrary to common perceptions, they were neither affiliated with the GOP as a group nor supported President Bush as a group. They were later joined by former POWs (Prisoners of War) who had their own bone to pick with Senator John F. Kerry. The POW group included two recipients of the Congressional Medal of Honor, America’s highest award for Valor in Combat. Far from a smear tactic, Swiftboating a politician aptly means: swiftboat - vt. To reveal the essence of a defective person. To shine truth on a lie or lies. To reveal an inconvenient truth a politician desires to keep hidden. swiftboat-ed, swiftboat-ing. Thanks to the bravery of these aging Veterans, America was saved from a political opportunist occupying the White House. Senator Obama and the Democrats should be deeply ashamed for their actions taken to smear such Honorable Veterans. If the Junior Senator from Illinois feels smeared perhaps a more appropriate term would be “Clintonized,” as the dirty tactics of the former first couple are widely known. America’s Veterans, the same Veterans Democrats constantly remind us they support so much, deserve better then to be continually smeared for exercising their own constitutional rights, rights they fought for others to have as well. The impact this group has had is apparent in the constant smearing of them nearly four years later, even though the group “stood down” shortly after the 2004 elections. Their story has been published in a book, To Set The Record Straight: How Swift Boat Veterans, POWs and the New Media Defeated John Kerry, recently. Above all, it is time the Democrats stopped smearing Highly Decorated and Honorable Combat Veterans that exercise their own constitutional rights. To those who believe the swiftboaters, it means as you state. To those who don't, it means a smear campaign. I guess whomever contributed to wikipedia must not believe the swiftboaters claims. Eileen, that's sort of the point of this post, to show how the left misuses and misrepresents what the Veterans did. For all their cries of "Support the Troops" and "Veterans," they have neglected from day one the fact of these guys all being Highly Decorated Combat Veterans and former POWs who deserved to be heard. As for any disproving of their claims, all Kerry ever had to do was reveal his full and complete Military Records, not just the 30 odd pages he allowed 3 friendly reporters to see, to the public, like he and the Democrats demanded of President Bush, who did authorize his records be made public. To date, Kerry will not allow the public to see his full and unedited Military Records, leaving many questions on his service open. Going after his medals might not have been the best avenue to begin with, but Ican truthfully say that not one guy I served in Viet Nam with would have taken any of the medals he did for what he claimed happened. I question 3 Purple Hearts and not a single night in a Hospital. Since you also served, I would imagine that would raise a flag with you as well. Every time the left cries "Swiftboating" to indicate lies and smears, they besmirch the honor and integrity of Veterans of both parties who opposed Kerry for his nefarious conduct upon his return from his abbreviated tour. If you or anyone else are truly interested in what they did and what motivated them, purchase a copy of the book I linked to, or seek it from your library, and read it through. Everything is well documented in the last portion of the book. Actually, the tools who lent their names to this odious event brought dishonor onto themselves by doing so. They were used, and they should have had the good sense to see this sham for what it was. Real heroes don't care what others think - they're confident in and of themselves. By contrast, you've got a pretty thin skin in all of this, which pegs you pretty clearly. Snarky, that is one of he most pitiful pieces of tripe I've ever read. You obviously know nothing of either the Swift Vets nor Veterans, just the usual hate America crap you commies are known for. Do even half of what they have done for America, then see. Or, since ones like you tend to cower in fear, read all about it in the book. Like I said - real heroes, thin skin, etc. You protest too much. LOL, snarky. Who continues to returnh to protest?